This is the oldest course, is renowned for its difficulty, thus making it more suitable for experienced players. Fairways are narrow and well protected by old trees requiring more straight shots. It is shorter and hillier than the south course and has more water obstacles. The course requires straight drives down the middle of the fairways as failure to do so may have one ending up in one of the numerous water hazards hidden in the rough. 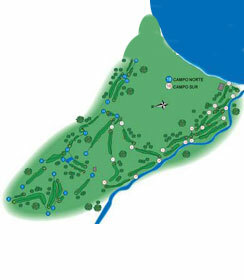 Besides the two 18 holes golf courses, Guadalmina complex offers a par 3 nine hole course.